HEUCHERA: Vigorous and large flowered, these varieties make excellent border plants with their nearly evergreen foliage in neat clumps. Bright flowers are held aloft on airy stems in May through July. Can be used in a shady courtyard, pot or as a groundcover under deciduous trees. Benefits from deheading. 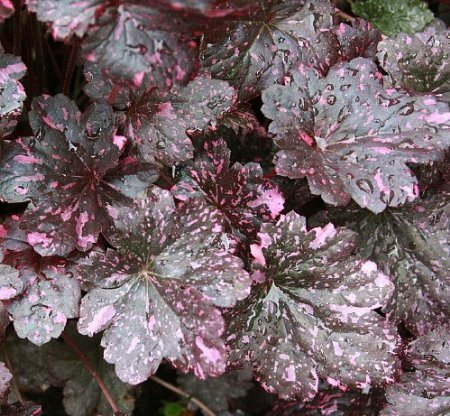 Heuchera 'Midnight Rose' Midnight-purple foliage splashed with bright hot pink - what a knockout! Takes summer heat and humidity as well as cold winters, but needs well-drained soil. Dainty flowers top the foliage in summer. 12" tall.